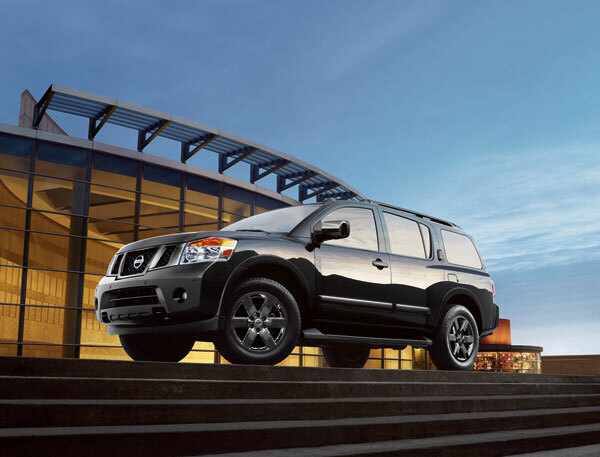 The Nissan Armada is Nissan’s full size SUV. With a sharp, chiseled exterior and room for 8 people inside, it’s no wonder this beast continues to compete with other popular full-size SUVs such as the Ford Expedition and the Chevrolet Tahoe. The Nissan Armada was first introduced in 2003 for the 2004 model year. Originally, it was named the Pathfinder Armada, but Nissan dropped the prefix for the Armada’s second year of production. The Armada was built on the capable Nissan Titan frame and offered 2 trim options until 2010 when the more expensive LE option was split into two different trims – the Titanium and Platinum trims. Until 2007, the Armada offered an additional SE Off-Road trim for the most adventurous buyers. The Off-Road trim included features like skid plates, a lower final-drive ratio, and all-terrain tires. A redesign happened in 2008 with minor exterior changes and a major interior overhaul. New technology such as keyless ignition, Bluetooth, and a hard-drive-based navigation system were also introduced to the Armada that year. Nissan announced in 2013 that we will see a new generation Armada in 2015 or 2016. The SUV will be based on the next-generation Titan – remaining a full-size SUV, but it will conform more closely to constricting environmental regulations in order to boost efficiency. When the Nissan Pathfinder was introduced, Nissan chose to hide the door handles as a part of the “C” pillar in order to make it appear visually like a two-door truck with a camper shell, with conventional door handles only on the front doors. This has since become a design tradition for Nissan, which the Armada adopted.